Bookstand Publishing 2008, ISBN 978-1-58909-486-4, 320 pages with downloadable complete Xilinx ISE WebPACK project files. Text announcement can be download here. This text is intended as a supplementary text and laboratory manual for undergraduate students in a contemporary course in digital logic and embedded systems. 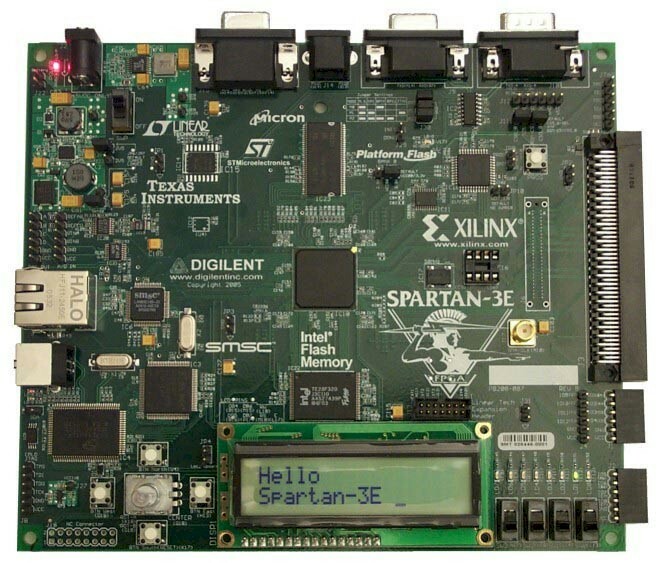 Professionals who have not had an exposure to the fine grained FPGA, the Verilog HDL, an EDA software tool or the new paradigm of the controller and datapath and the FSM will find that this text and the Xilinx Spartan-3E Starter Board provides the necessary experience in this emerging area of electrotechnology. 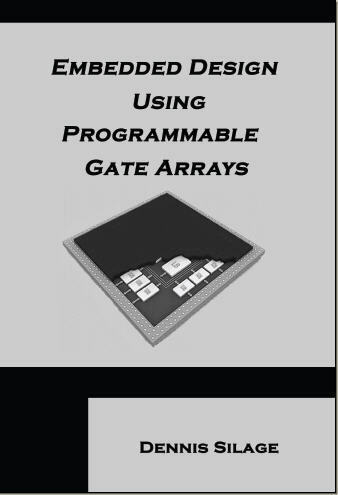 Embedded Design Using Programmable Gate Arrays describes the analysis and design of modern embedded systems using the field programmable gate array (FPGA). The FPGA has traditionally provided support for embedded design by implementing customized peripherals and controller and datapath algorithmic state machines. Although microprocessor-based computer systems have usually been used for the design of larger scale embedded systems, the paradigm of the FPGA now challenges that notion of such a fixed architecture especially with the constraints of real-time. This new paradigm in embedded system design machine describes the Verilog behavioral synthesis of finite state machine as a controller and datapath architecture in digital signal processing (DSP), digital communications, digital control and data communication utilizing the FPGA, the integration of external interface hard peripherals and the implementation of a custom internal soft core peripherals and soft core processors. The transition to embedded system design now in the massively parallel and fine grained architecture of the modern FPGA is described in-part by the translation of C/C++ program segments for real-time processing to a controller and datapath architecture or an algorithmic state machine. However, the emergence of the Xilinx 8-bit PicoBlaze and 32-bit MicroBlaze soft core processors now also challenges the conventional microprocessor with its fixed architecture for embedded system design. An excerpt from the text entitled DSP on the Spartan-3E Starter Board was published on Programmable Logic Design Line (www.pldesignline.com) and available for download here. Download Complete Xilinx ISE WebPACK Projects to accompany Embedded Design Using Programmable Gate Arrays for the Spartan-3E Starter Board can be downloaded in ZIP archive format here (~30 MB, s3eEDPGA.zip). The ZIP archive files are password protected as described in Appendix A of the text.